“Things fall apart, the centre cannot hold”, as WB Yeats writes in his apocalyptic poem The Second Coming. 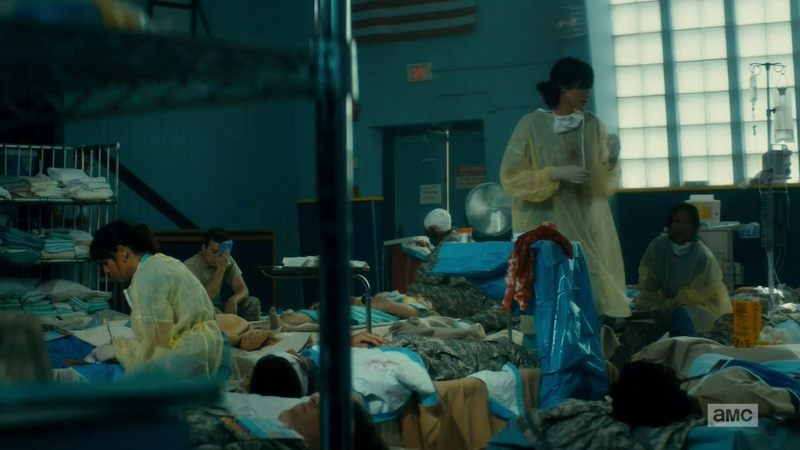 In this penultimate ep of Fear the Walking Dead, we see that process in action, as even the Gestapo-like National Guard start to crumble and run, while the understaffed ‘hospital’ is seen to resemble the sort of battlefield infirmary you might have seen in the Civil War, complete with prison stockade. Zombies were again underplayed this week; though as we saw last week, that can work very well at throwing the emphasis on the jeopardy posed by the living. The military continued to be intimidating, best personified by the increasingly unhinged Lt Moyers, who remarked “I can do whatever I like, I’ve got guns. The dead may be walking among us, but this is still the United States of America”. For the last few eps, the show has very much taken the line that the US military is far from a reassuring force, building on popular perceptions fostered by their conduct in recent wars. That’s nicely cynical, if probably a little unfair, though at least the script presented them as individuals with differing views on their orders. Still, however brutal and sadistic they may be, to the cordoned off survivors they represent the last vestige of order. When they start to fall apart, as they did this week, it feels like the collapse of society is all but complete. And it has felt fast, despite the slow burn of the season’s first three eps. Fear the Walking Dead has often felt like a show unsure about quite what it wants to be, but since last week it seems to have settled into a more conventional account of the apocalypse. That’s not saying or doing anything new, but more likely to catch viewers’ imaginations than the (intentional) slow pace of the early episodes. After five seasons, the strength of its parent show is no longer in the novelty of weekly zombie attacks and their attendant gore; it’s in the strongly written and played characters, the way they develop, and the way they conflict. As a show about the transition from the normal world to the one we’ve seen there, Fear has, up till now, had far less compelling characters – characterised by soap opera plots and spoiled teens. As the world changes, though, they’ve started to become more interesting. Travis’ wayward (and deeply annoying) son Chris (Lorenzo James Henrie) and Maddie’s previously self-absorbed daughter Alicia (Alycia Debnam-Carey) spent a chunk of the ep breaking into, and vandalising, an opulent mansion on the grounds that “these little bastards had the childhood we deserved”. That’s still a very selfish attitude, but it becomes interesting when the end of the world gives selfishness licence to become destruction and thievery. The characters may be developing, but as in the parent show, it’s not always for the better. However, again as in the original Walking Dead, tribalism, brutality and ruthlessness may be unpleasant but may also be the only pragmatic way to survive. 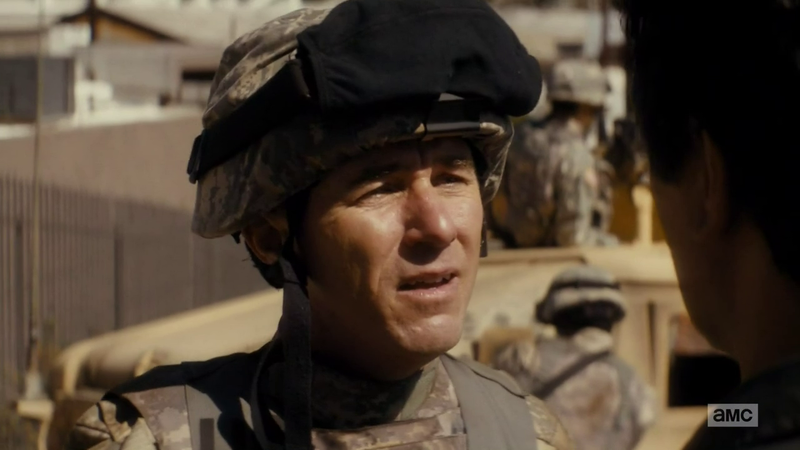 Poor old Travis spent the ep figuring that out, initially still putting faith in military authority and unable to bring himself to shoot a Walker. He’s still not adjusted to the end of civilised society, but Maddie (who’s been gradually developing a core of steel) was calmly willing to allow the captured Cpl Adams to be tortured in order to find out the location of her son. That torture shed more light on the show’s (so far) most interesting character, Daniel Salazar. Once again, the parallel was made with the dark days of El Salvador’s brutal civil war, with Daniel’s significant remark, “the man with the blade and the man in the chair, they’re not so different; they both suffer”. Obviously that was a clue to his later confession that, given the choice, he’d chosen to be the man with the blade. 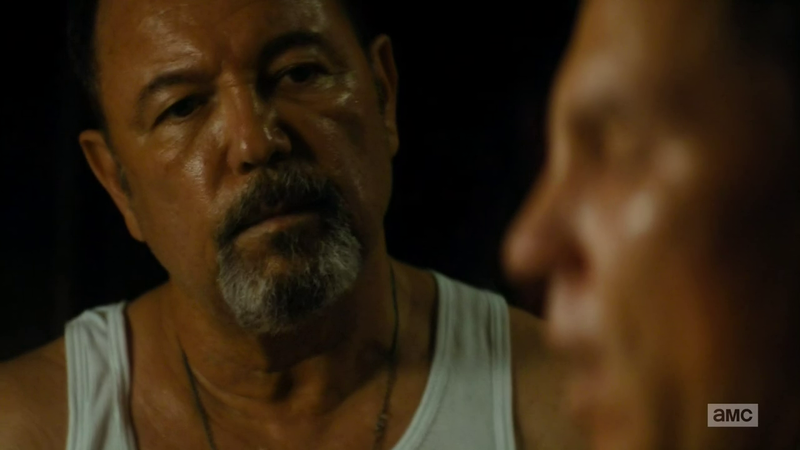 It’s a difficult thing to do to make a former torturer sympathetic and even understand his motives; but David Weiner’s writing and Rubén Blades’ acting pulled it off. Kim Dickens also nicely underplayed Maddie’s reaction – seeing Daniel scrubbing his bloody hands, her first question wasn’t “is he alive?”, but “did he tell us what we need to know?”. She’s come a long way from the suburban guidance counsellor preoccupied with her problem children, and is plainly already better equipped to survive the situation than her overly sensitive fiancé. It’s a good touch to have this spinoff’s equivalent to Rick Grimes be female (though the women in The Walking Dead are hardly pushovers either). Nick, one of the other truly interesting (if unlikeable) characters didn’t get much to do this week, locked in the hospital stockade as he was. But he did get to meet another debuting character who’s plainly going to be a major player – slick salesman type Strand, played by the charismatic Colman Domingo. 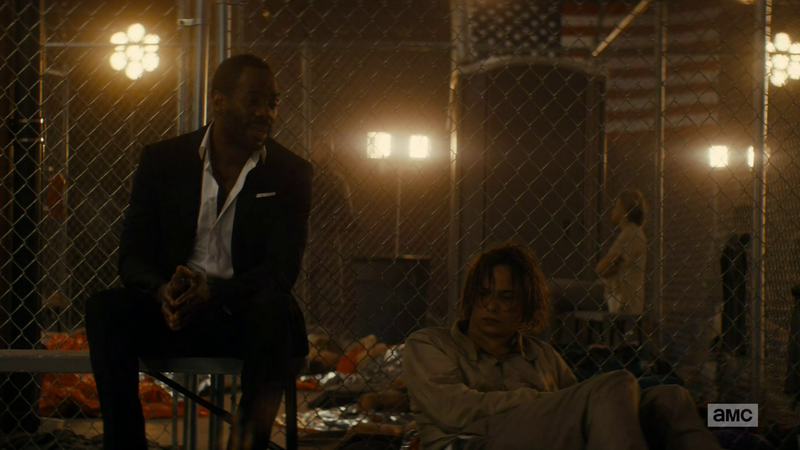 It seemed a bit odd to be introducing a major character in the season’s penultimate episode, but Strand certainly made an impact from the very beginning, talking the already unstable Doug into a full-on breakdown. Nick was mystified as to why Strand would save him from the trigger happy military; Strand, for his part, remarked, “I’m not saving you – I’m obligating you”. Clearly one to watch, he looks likely to thrive as the world falls down. Over at the hospital, Travis’ ex Liza (Elizabeth Rodriguez) was also starting to face the Harsh Realities of the Situation, as she learned a bit more about the contagion. While Travis might have been unable to deal with a Walker even at long range through a sniper scope, Liza was (eventually) able to put a slaughterhouse bolt through the skull of the recently deceased Griselda Salazar. The knowledge that everyone who dies will turn must have helped; as it’s already common knowledge in the parent show, there was no point stringing that one out too long. What was an enigma this week was that mystery word “cobalt” that kept cropping up on all the military comms channels. Given how the Army have been acting, it wasn’t hard to figure out that, whatever this was a codeword for, it wasn’t going to be nice. Still, given the specific word, I must confess I’d been expecting it to refer to a nuclear strike; the confession that it was a plan to evac military personnel while “humanely terminating” the civilians was almost a relief by comparison. So, with the military falling apart and running, but presumably a few dedicated patriots willing to remain to carry out that fateful last order, I’m guessing the season finale is going to involve (finally) some real action. And not just of the military variety either; that barricaded stadium that’s obviously full of Walkers (shades of Hurricane Katrina and the Superdome) may well come into play, giving us a proper zombie horde for the first time since the show started. With the second season already confirmed, the showrunners have the luxury of not depending on this ending for the show’s renewal, but hopefully it’ll manage to satisfy on both a dramatic and an excitement level.